Concerns regarding the environment and the impact humans constantly have on it have been growing concerns for decades, but there is still a substantial lack of environmental literacy and action among most of the population in what they can do to reduce the damage they may be indirectly causing. The environmental impact of technology usage continues to garner attention as fears of built in obsolescence and high turnover of devices contribute to larger negative impacts. 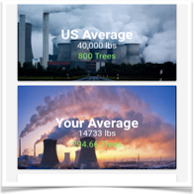 Our research aims at increasing environmental literacy and awareness along with giving users actionable steps and interactions to empower them with greater control of their individual carbon outputs and carbon footprints. By utilizing devices and technology that users may already have and incorporating sustainability into the design of new products, we may be able to make it easier to measure an individual’s impact on the environment. This may also help in reducing the amount of electronic waste that ends up frequently in landfills by promoting more sustainable solutions. By reducing consumption of resources, promoting renewable energy, and more environmentally friendly daily activities in localized areas, we may be able to encourage greater interaction and sense of fulfillment through local ecosystem engagement rather than just focusing on a global level.